Software System Safety Training at the 9th IAASS Conference » A-P-T Research, Inc. APT will be hosting a Software System Safety Training Class in conjunction with the 9th IAASS Conference. 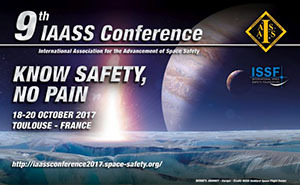 The 9th IAASS Conference, “Know Safety, No Pain,” is October 18-20 in Toulouse, France. The conference is the premiere international forum dedicated to the discussion of a wide variety of space safety topics.